The Canon Court Sports Package is designed specifically to combat the low and often terrible lighting of indoor arena and court sports. The 1D X's high ISO capabilities paired with the very fast 200mm f/2L IS means clean, clear shots in the darkest gyms. While fixed in length, the 200mm provides the right amount of reach for sideline shooting and the included 2x extender will get you up to 400mm while dropping your maximum aperture to a reasonably f/4. The lens' rotating tripod collar attaches directly to a monopod, which provides enough support to keep you from fatiguing but is ultra portable and still gives you full mobility when you need to chase down the action. Simply rotate the collar to shoot in portrait orientation. The monopod is made from carbon fiber, so it is lightweight, and can be adjusted from about 1.5' to over 5' quickly with just a twist of the rubber locks. It is thin enough to comfortably use even within the confines of the bleachers. The 1D X is the ideal camera for sports, with a shooting speed of up to 14 FPS. The dual memory card slots are essential for overflow or as a fail safe when you write to one card and assign the other as backup for the first. Please note that memory cards are not included with this rental. Please note that memory cards are not included with this rental. It is recommended that you rent or purchase (2) CF cards with 1000x write speed or a write speed of at least 160MB/s for maximum performance. Please refer to this chart for more details. The image stabilization of this lens will provide you with up to 4 stops of shutter forgiveness for extra exposure latitude when shooting indoors. The focus preset function allows for returning to a specifically set focus point by turning a ring in front of the focus ring. This is a great feature for capturing predicted action near the net. The Focusing Range Limiter allows you to set the focus distance range to minimize AF time based on the distance of your subject. This, along with the 1D X's 61 focus points, means extremely low chances of missing your shot. Distance and depth-of-field scales are clearly visible on the lens barrel. Lastly, this lens produces beautiful out-of-focus backgrounds and can really separate the athlete from their surroundings. 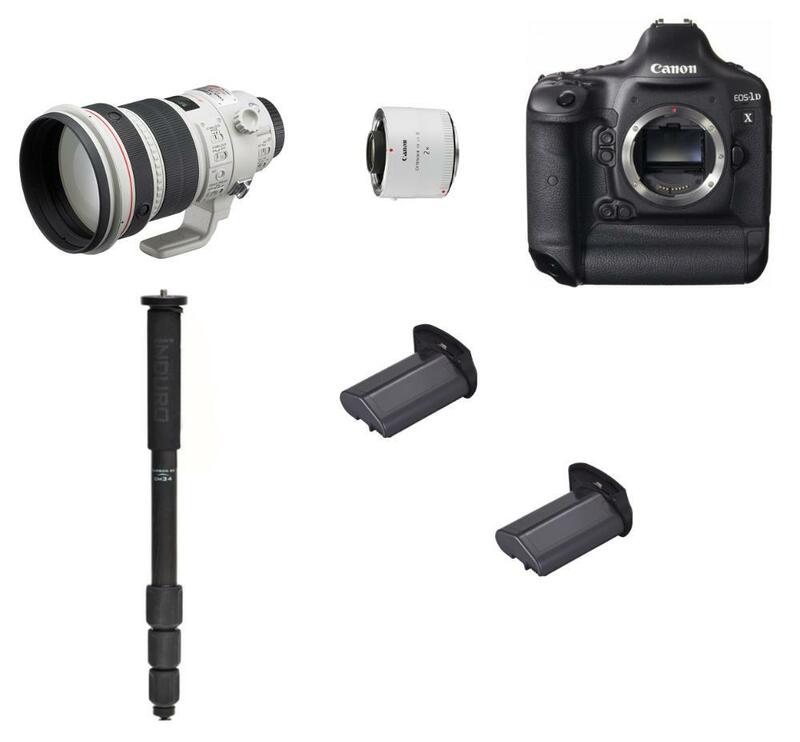 This package isn't the lightest setup but it is still very portable, especially thanks to the monopod, and offers all of the features needed for low-light, high-speed sports shooting. It is also very well suited for indoor ceremonies, graduations, and other arena events when shooting at a distance. • The 1D X is a full frame sensor camera and is compatible only with EF mount lenses. It is not compatible with EF-S mount lenses. • Memory cards are not included with this rental. It is recommended that you rent or purchase (2) CF cards with 1000x write speed or a write speed of at least 160MB/s for maximum performance. Please refer to this chart for more details.